Lux Candle holders || Design: Kristina Stark. 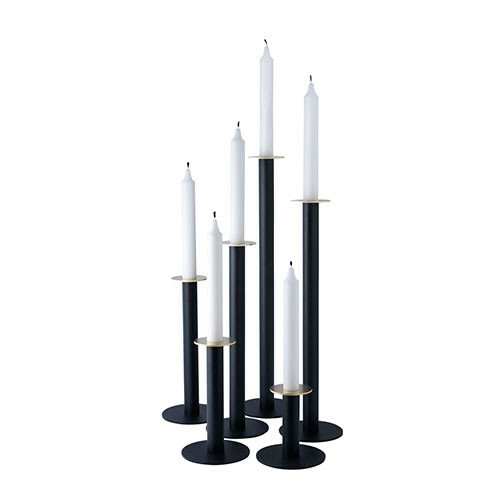 Candle holder in powder coated iron in black including a round candle ring in brushed solid brass or in white including a candle ring in solid stainless steel. Mix and match as you wish. Lux candle holders was nominated to Formex Formidable 2010 at the Formex design fair in Stockholm 2010. Lux no 1 Height 100 mm. Lux no 2 Height 165 mm. Lux no 3 Height 230 mm. Lux no 4 Height 295 mm. Lux no 5 Height 360 mm.